Feedback: 23 comments - leave yours! 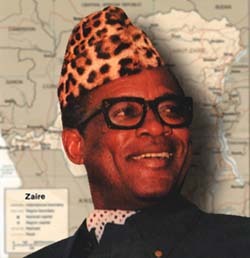 President Mobutu confiscated the riches of his country for his personal benefit for the 40 years of his ruthless reign. They won't name schools after him - no doubt about that. But as African dictators come, he was charming, clever and colorful. At the end of the day, Western governments only gave him the cold shoulder only when he lost grip on his country. Before that, he was welcome in all Western capitals and his trademark bright shirts, leopard-hide hat, heavy rimmed glasses and scepter were familiar sights in Western governments. He was even a personal friend of George Bush Sr and they even went to each other's house on vacation. Mobutu enjoyed Western sophistication and would regularly stop at the Central Bank of Zaire, grab a couple Vuitton bags filled with fresh dollar bills and fly to France where his wife would plunder shops in Paris and Monaco. Mobutu also owned houses in various countries in case things went sour back home. Here is the story of how I visited Mr Mobutu private home in Switzerland and managed to buy Mobutu's brandy and his own leather sofa - all for a price that would make Ikea look like Armani. Mobutu's Swiss house in Savigny was just outside Lausanne, a city which he visited very regularly. As his prostate cancer continued eating him, Mobutu got treatment in our regional public hospital, the CHUV, and stayed at the Beau-Rivage Hotel. Nobody had ever seen the house nor really knew where it was. He died in 1997, shortly after having lost power to a man who proved to be no better than him at managing the country and definitely not as stylish. All I knew about Mobutu were press and television coverage or movies like When We Were Kings or Mobutu, King of Zaïre, until one morning in 2001, I read an article about Mobutu's house and furnitures being sold at public auction. I rushed to the auction room in the village of Savigny just outside Lausanne (aerial pictures), but the auction was already under way and I didn't buy anything. A local baker bought Mobutu's legendary scepter and resold it at a high profit to his grieving widow who, like me, had arrived too late. The room was packed with 400 people who had come out of curiosity. The next day, the paper said there would be two additional Mobutu auctions, first for the larger items in the house and then the house itself. I wrote the first date down in my diary and called a big-shot Hollywood screenwriter friend who shares my interest for the extraordinaire. Would he want to come with me? He certainly did. 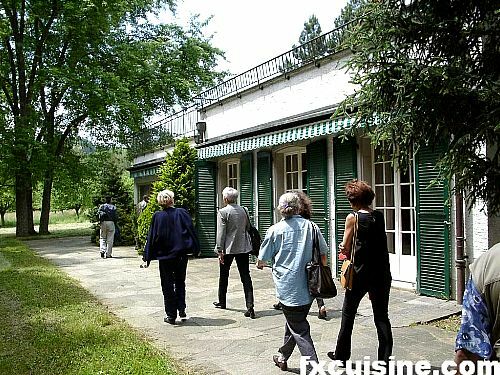 So on June 13th, 2001, we arrived at Mobutu's house on Route des Miguettes 22 in Savigny. What a feeling. A softer version of the French revolution, with crowds of local farmers who finally could see inside the house of the big man they knew lived in their neck of the woods. A strong, historic feeling of sic transit gloria mundi 'Thus ends this world's glory' invaded me as I saw the locals, me included, swarming across the estate. 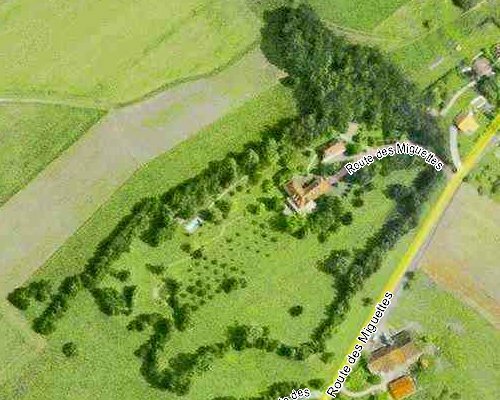 The house was big but didn't look grand apart from the 60,000 square meters estate all around it. Mobutu had bought it in 1968 and the furniture hadn't changed much since then. A few armed bodyguards manned the guest house permanently, with a complete 1960's military com center inside. The furniture was old fashioned and bought locally. The neatest thing was the absolute privacy provided by hedges upon hedges of orchards and woods. The auction started outside. The public auctioneer - a local civil servant - was clearly quite excited. He would be. This must be the auction of his life, with loads of journalists and the most unusual items. He had bought himself a new suit, quite tasteful, but forgot to take the label off the left sleeve. All of this made for a very special ambiance. 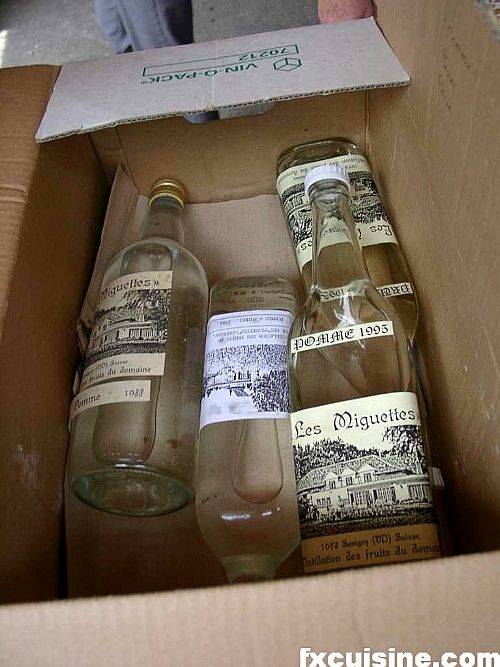 My friend and I drew near the bench on which the auctioneer was standing, and saw him start the auction with a box of Mobutu's own brandy, made with the fruits from his fenced estate orchard - Mobutu's private garden if you will. Apple, pear and quince. "20 francs. Who offers 20 francs?". 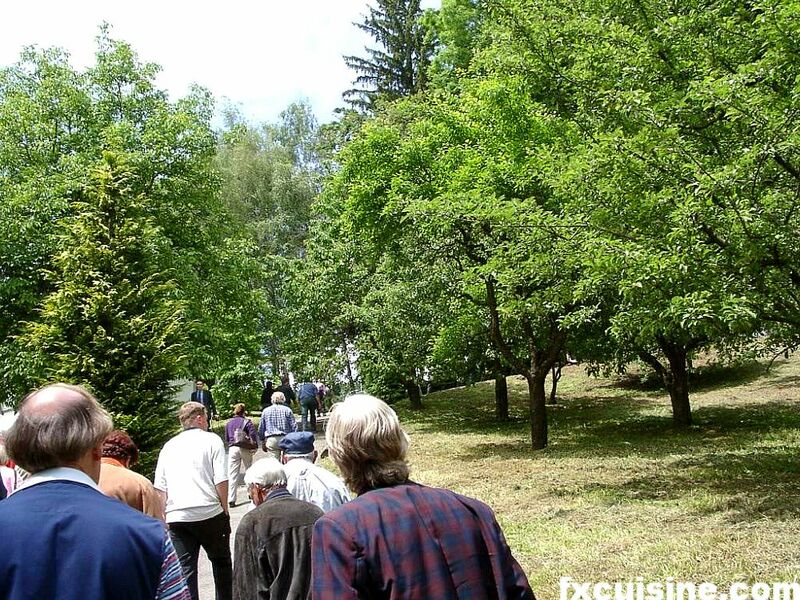 There must have been 200 people around, all had 20 francs in their pockets and drank alcohol, but nobody bid. "Come on, 20 francs, who offers 20 francs!". People looked at the brandy, then looked at each other, but nobody bid. They all feared Lord Carnavon's destiny, the curse of the African Pharaoh upon he would would first break the tomb open. God be my witness, I was the first to bid. "I'll take it for 20 francs" I said. Nobody raised the auction. 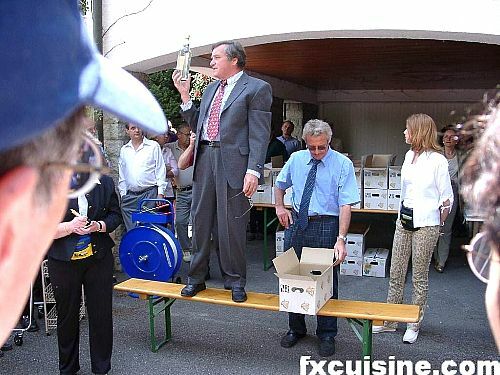 "There you go" said the auctioneer, as his assistant promptly brought me the crate and collected the money. The auction continued for Mobutu's collection of Petrus, one of the most expensive wines in France, which went for about 500 francs a bottle. The baker was here again. I was very much taken by the President's personal library, which included a copy of The Congo Cables, the definitive book about his coup in 1965, with handwritten annotations. 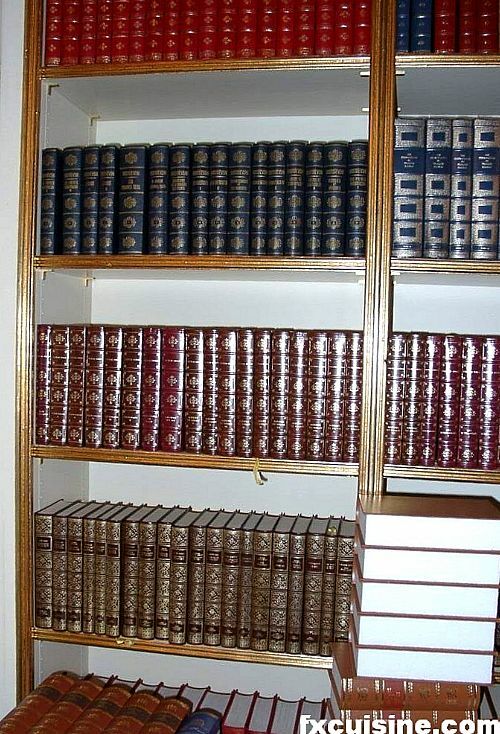 The rest of the library was by-the-yard book furniture (photo). I think nobody in the room noticed the historical importance of the book - like having a copy of the War of the Gauls annotated by Julius Caesar. Pretty interesting. But the auctioneer would not split the lot and auctioned the entire library as a whole. I bid timidly and the baker bought it for about $10,000. By the auction's end most of the furniture was gone and I noticed a small three-seats black chesterfield sofa in a corner. Nobody was interested, but it was a fine piece of furniture despite/regardless of its provenance. I bought it for 400 Swiss francs, about $250 at the time. The deal of the month. Later the President's bodyguard, who lived in a separate house on the estate, explained that this particular Chesterfield was in the President's private office. I don't know if that makes it more valuable or less, but after all these years I still use it every day! The private rooms upstairs were closed to the public but we saw an armada of banged up presidential limousines complete with inside curtains like a hearse. 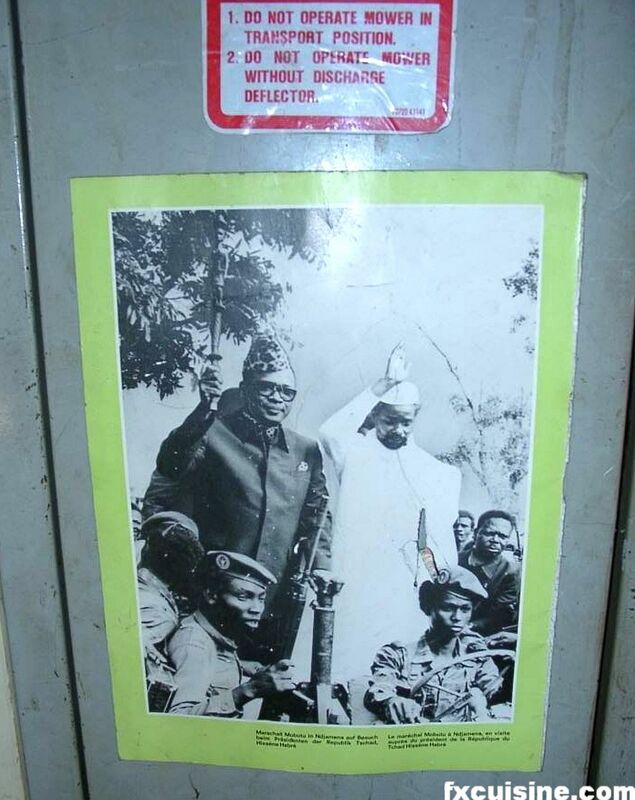 In the garden sheds there were a pictures of Mobutu (picture). As I was waiting for a local mover to come and collect my Chesterfield, my friend (above) called his wife from Mr Mobutu's estate to tell her the day's adventures. The pictures on this page were taken with an old digital camera and are not too good - my apologies. In case you wonder - I am no supporter of Mr Mobutu. Frankly even socialism would have been better than Mobutism. But he who can resist buying a colorful deposed African dictator's booze and sofas cheaper than at Ikeas can cast the first stone. So, is the brandy any good? Yes, the brandy is very good, but I don't really drink from it all that much. You can never stop wondering if it's been poisoned or if you'll incur the Curse of Mobutu! 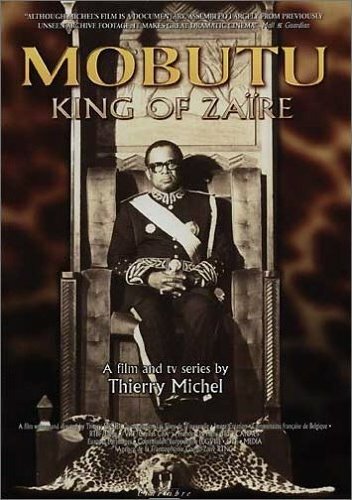 Thank you for your show here, I have a special favour to ask!will you kindly send me one copy of the cinema MOBUTU KING OF ZAIRE.MY ADDRES IS:THOBIAS KALOKOLA C/O GRACE WILLIAM P.O.BOX 9083 DAR ES SALAAM TANZANIA.EAST AFRICA.THANKS IN ADVANCE. Thank you for posting such an interesting story! I wonder if Mobutu's wife is still alive? I wonder if you could answer a question - about his "library" of books, what were all these other books? What are the books in the picture, what other books were there, and how many were there? Sorry for so many questions but am really interested to find out more about the lifestyle of this guy. Thanks. Anthony, thank you for your visit! 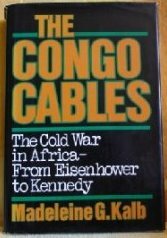 Yes the Congo Cables is an interesting book, it is widely available nowadays, of course without the late Maréchal's handwritten notes unfortunately. I hope Africa will see leaders with more concern for the good of their population in the future. 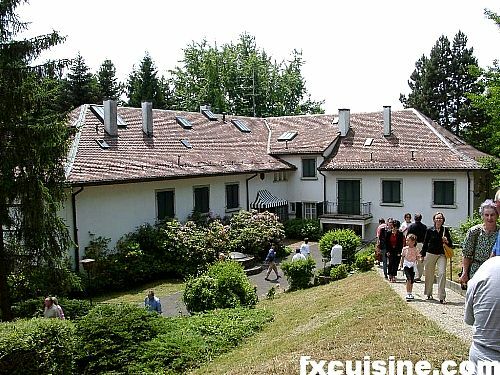 Dear Sir Or Madame,Can you please let me know other Mobutu's property in Switzerland also I would like to know did Mobutu's former wife Marie-Antionette did she own a hotel in Switzerland? If yes can you please let me know more about it in details. I AM IMPRESSED BY YOUR ARTICLE ABOUT THIS GREAT AFRICAN DICTATOR. Your mention about the personal freindship between Mubutu and Bush Sr is amazing! Who finally ended up with the cash that this man looted! 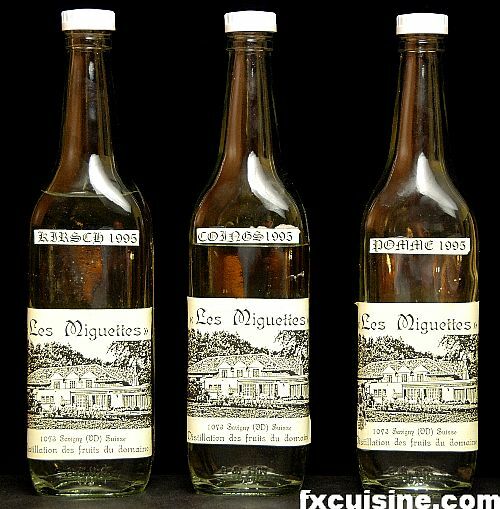 Mobutu,was a real hero to Africans but the image he encountered by taking advantage to the people of Congo was inhuman & may history judge African leaders of a kind (President Robbert Mugabe)Can I have some taste of of the Brandy?am thirsty. Quite an interesting piece, but do you have any idea who bought the house? And the proceeds from the auction, who did it go to? and you not have the wine analysed and tested for poison.. So do you know once and for all? Razaq, apparently the house was sold at legal auction because of some debt Mr Mobutu had towards a local businessman, so I assume the proceeds went to him. I drink from Mobutu's brandy regularly and am still fit to post here, so if it's a poison it's a very sweet one! Very interesting article, I was born in Zaire during mr Mobutu's reign and moved to the US since mid 80's. please send me more info about MR MOBUTU. sorry to say but I am a fan of mr MOBUTU.......thank-you. Question #5 if you would like to contact the young and let him know that I am writing a book at this time about my time with Mobutu from 1994-1995 it would be appreciated. FX's answer→ Thomas, the only contact I have ever had with this family was to visit their house on auction day - no idea where they are shacking up at the moment! I am pleased that you sit on my sofa drinking my personal brandy. Do you feel my presence? Do you imagine me sitting there drinking my brandy? Do you imagine yourself to be me? 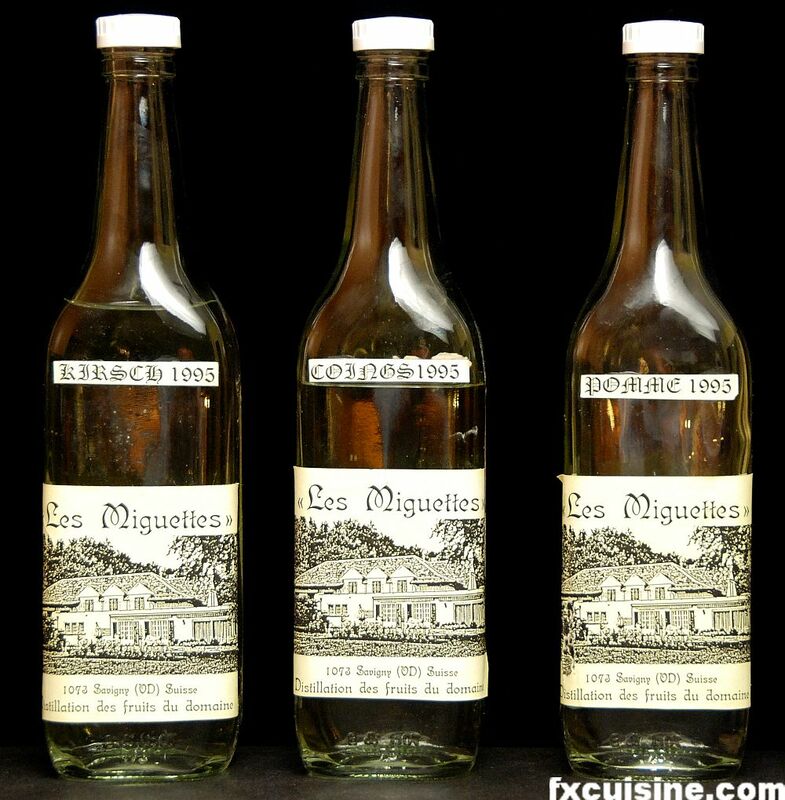 I would very much like to buy a few bottles of Mobutu's Brandy. Would you be willing to sell any? Or could refer me to anyone who might be willing to sell? I spent 2 years travelling through West Central and East Africa in the late 1990's and like to collect remminants of that era. Dear François-Xavier, I happened upon your blog while looking for a pumpkin penne recipe, and have been savoring all the other entries for a few days now. I scan through a lot of food blogs without much thought, but yours is truly exceptional. I spent the last two and half years working (and trying to cook) in the Democratic Republic of Congo and was therefore particularly interested in this post. One note: rather than forgetful, I think the auctioneer was in fact being quite ironic by leaving the label on his suit. It's actually quite common to see labels left on suits in both the Democratic Republic of Congo and neighboring Republic of Congo, where Armani and Gucci suits are worn (labels still on) as status symbols by fashion-devoted members of the "sapeur" movement. Many times I saw Congolese women with knock-off handbags that looked like they'd been used for years with price tags and plastic wrapping still attached from the day they were purchased! Why oh why did you stop posting and updating this blog? I hope it is because something wonderful happened, that you are working on a cookbook or a television show. Bien à toi et bonne chance! hi all now ex Zaire or Congo suffer because of Kabila if was Mobutu at the moment we can have war in Congo like Kabila playing with Kagame, but one day the will pay what thy are doing. FX's answer→ Ah I heard that from Congolese people before! I am a permissions researcher for a publishing company.We would like to use an extract from an article on Mobutu, in our forthcoming history textbook. 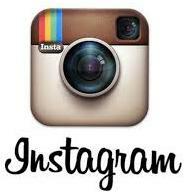 Can you please help me get in contact with the correct person in your organisation? I miss you my Dear President. Before you the country was in chaos and after not only the country in chaos by moreover the country is K.O.